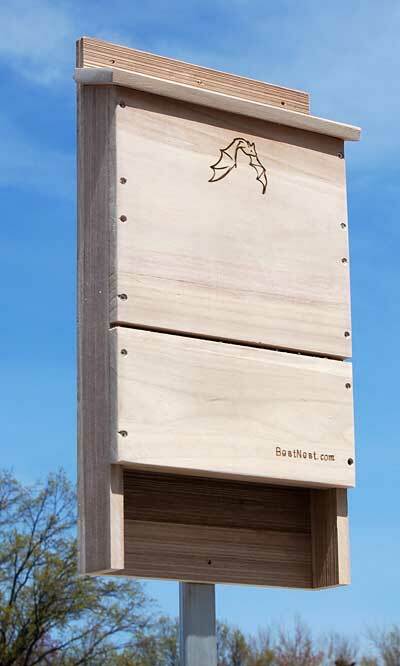 Invite a beneficial colony of bats into your backyard with the BestNest Single-Celled Bat House. Meticulously designed for efficiency, this sizable bat house will allow for a much higher occupancy percentage than smaller units. The interior surface and landing platform are crafted from deeply grooved wood, creating an excellent clinging surface for landing and roosting bats. The single chamber measures 1.75" deep with a 1" entry gap, while a 0.25" ventilation slat in the front helps to regulate temperature and increases air circulation. The slanted roof offers a unique tongue and groove assembly to keep the interior dry and safe from the elements. A beautifully designed emblem of a bat in flight adorns the front surface, and the furniture grade wood construction is built to last. This house may be mounted to a vertical surface with any of the three predrilled holes at the top and single stabilizing hole at the bottom. Bring these interesting and helpful creatures into your yard with the BestNest Single-Celled Bat House.